Pete Bannan — Conestoga prevailed in double-overtime, 60-59. 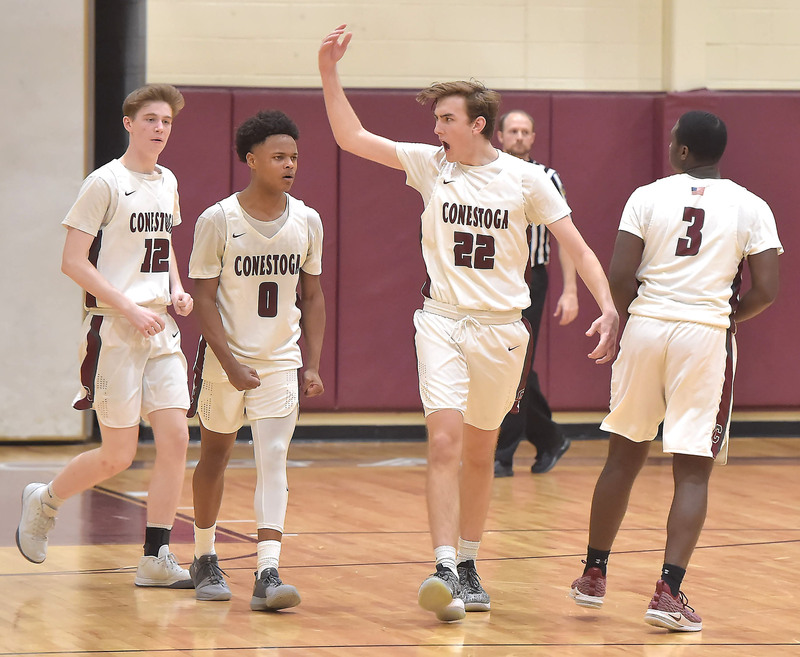 TREDYFFRIN >> For its senior night Friday evening, the Conestoga boys basketball squad set itself up for a tough test against a red-hot, athletic Ridley team on a seven-game winning streak. The Green Raiders held the lead for the first 26 minutes, but the Pioneers (13-7, 11-3) finally caught up in the fourth quarter. 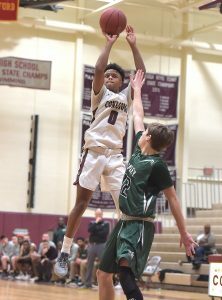 The game went two overtimes before Conestoga prevailed, 60-59. The double-overtime battle featured rugged, physical defensive play on both sides. It wasn’t pretty but it was spirited. Ridley (11-6, 6-6) came out smoking after the game’s opening tip-off, jumping out to a 7-2 lead, thanks to the inside scoring of senior forward Meese Tobey and junior center Enoch Clark. Clark provided a strong presence for the Green Raiders throughout the night, and finished with 25 points. “Clark’s really been coming on for us the second half of the season,” said Ridley head coach Kevin Kelly. Ridley maintained control, and a small lead, the entire first half. At halftime, the Green Raiders led 23-19 with Clark and senior guard Malachi Williams providing 17 points. The Green Raiders also were getting solid rebounding in the first half. Ridley still led 34-30 early in the fourth quarter, then Conestoga went on an 11-1 run. Pioneer senior forward Milton Robinson scored underneath, then Conestoga senior forward Evan Medley grabbed a Ridley turnover and drive in to tie the score at 34-34. A minute later, Lezanic fought successfully for a loose ball under the basket, then fed Medley, who drove in for a 36-34 lead with 6:05 to play — Conestoga’s first lead of the night. Conestoga senior guard Shane Scott then grabbed a loose ball, and fed Medley, who was fouled and made both free throws for a 38-34 lead. Following another Ridley turnover (in the second half, the Green Raiders made 12 turnovers), Conestoga senior center Wesley Brace broke inside for another score and a 41-35 lead. But Ridley battled back. When Clark went 4-for-4 from the free throw line it cut Conestoga’s lead to 45-44 with 1:37 left. Lezanic’s free throw made it 46-44 with 1:19 left, then Williams made a steal and drive to tie the score at 46-46 with less than a minute to go. Three minutes into the first overtime, Ridley drove in for a quick score and a 51-49 lead; then 33 seconds later, Lezanic’s steal and drive tied the game at 51-51 — and a second overtime was around the corner. Twenty-six seconds in the second overtime, Robinson grabbed an offensive rebound and fed Brace, who scored and was fouled, making the free throw for a 54-51 lead. Shortly after, Shane Scott intercepted a Ridley pass and his layup made the score 56-51 with 2:41 left. Ridley didn’t quit. Clark scored underneath, then following a missed Conestoga shot, Ridley’s Jack Grace was fouled and made the free throw to cut Conestoga’s lead to 56-54. In the final 49 seconds, Lezanic and Shane Scott made four free throws to maintain Conestoga’s lead. The Pioneers led 60-56 with 16 seconds left before a Ridley free throw and Tobey’s putback made the score 60-59 with 0:00.7 left. Both teams had chances at the free throw line to put the game away. Conestoga was 16-for-32 from the free throw line; Ridley was 18-for-31 from the charity stripe. Troy said, “We’ll be spending some time on the free throw line as it wasn’t up to our normal standards. Ridley (59): Williams 5 0-0 11, Howard 0 2-2 2, Tobey 2 0-0 4, Grace 0 1-3 1, Clark 7 11-18 25, Santiago 5 4-8 14, Farro 1 0-0 2, Hudson 0 0-0 0, Neal 0 0-0 0, Tillery 0 0-0 0, Totals 20 18-31 59. Conestoga (60): S. Scott 3 4-8 10, M. Scott 0 0-0 0, Robinson 5 1-2 13, Rush 0 2-2 2, Lezanic 6 6-12 19, Medley 2 2-2 6, Steele 1 0-2 3, Barczak 0 0-0 0, Fox 0 0-0 0, Brace 3 1-4 7, Martin 0 0-0 0, Totals 20 16-32 60. 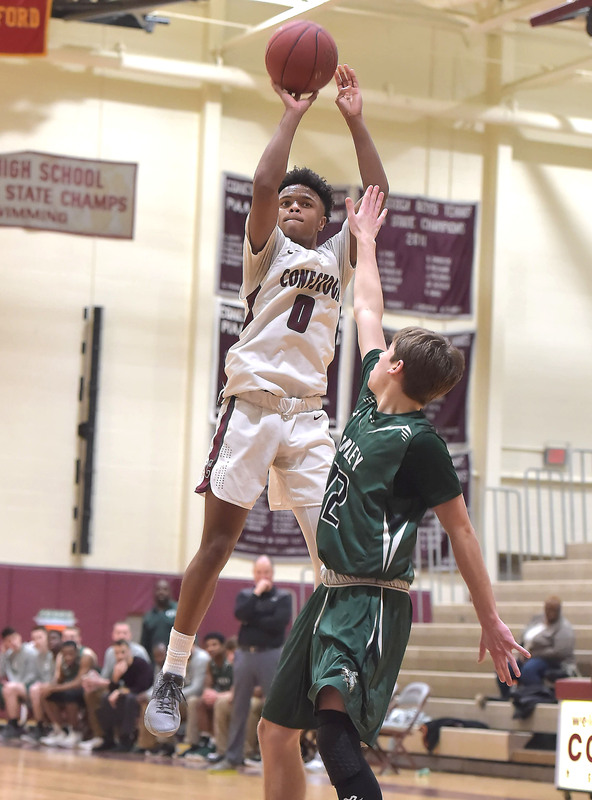 Three-point field goals: Ridley – Williams; Conestoga – Robinson 2, Lezanic, Steele. ← Previous Previous post: Stoga JV fends off late Ridley rally!